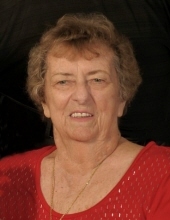 Janet Louisa (Evans) Vogt was born January 10, 1938 in Elm Grove, West Virginia. She graduated in 1955 from Triadelphia High School. She met Buck Vogt at a high school dance and they continued to dance for the next 65 years. She and Buck were married on July 13, 1958 at St Mark's Church in Wheeling WV. And immediately left for Buck's Air Force assignment in Great Falls, Montana. Besides Great Fall they lived in New Haven Ct, Key West Fl, Clark Air Base in the Philippines, Taipei, Taiwan, and San Angelo. After Buck retired from the USAF, she got a Real Estate Broker license and became a Rental Property Manager of 55 properties and an apartment complex manager until her retirement in 2005. She also was a member of the San Angelo Association of Realtors until retiring in 2005. She is also a member of the San Angelo Apartment Association. Jan has received her 50-year pin from the Order of Eastern Star. She served as a Worthy Matron and as Secretary of Chapter 826. She also served as a Deputy Grand Matron of the Order of Eastern Star of Texas. As a couple they also taught country/western dancing at the Santa Fe Junction Club, the Coachman Club, SAISD dance classes as well and 18 years at Angelo State Adult Continuing Education classes. They lost track of the number of graduates somewhere in the 700 plus students. They competed in The Senior Games (over 55) in dancing at both the local and State levels in Two-Step, Waltz and Swing categories earning 12 medals. The also appeared on 12 tv shows of the nationally televised show 'Club Dance" on CMT. They are 30-year members of the local San Angelo Western Dance Club. They volunteered for 14 years at Angelo Civic Theater and won "Volunteers of the Year" with RSVP. They assisted the choreographer of the play "Land and the River" in Country Western dancing as well as acting and dancing in the play. In all, they acted in a total of 14 plays and designed/managed the current volunteer usher program at ACT. They were also part of the group that brought Little League Baseball to San Angelo and she served as Secretary of the Southern Little League in the early 1970's. Family consist of husband; 2 sons Mark and Gary Vogt; and 2 grandsons Aaron and Michael Vogt. A Visitation will be held Friday, April 12th from 5-7PM at Harper Funeral Home. Services are Saturday, April 13th at 2PM in the Harper Chapel. "Email Address" would like to share the life celebration of Janet Louisa Vogt. Click on the "link" to go to share a favorite memory or leave a condolence message for the family.